What they do not note, however, is that the mortality rate never dropped below about 1-2 per 1,000 cases to 1 per 3,000 cases, nor do they note that the total number of cases (morbidity) didn't drop until the vaccine was introduced. 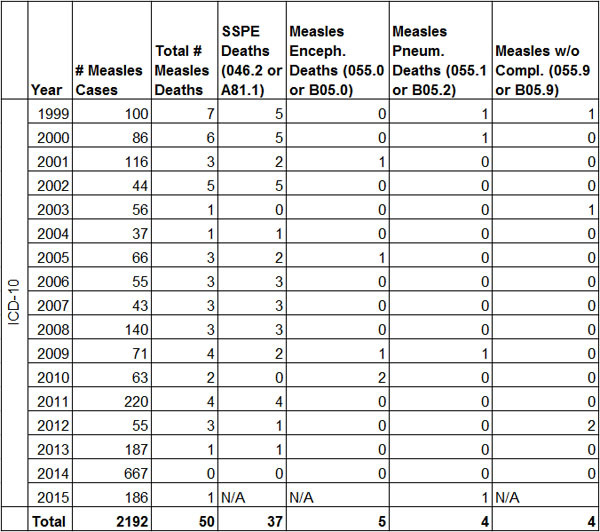 They will also generally not mention that the "no deaths since 2003" figure represents only lab-confirmed measles deaths. That figure leaves out deaths due to measles that were diagnosed clinically, but did not meet the CDC criteria for lab confirmation. Nor does the figure include deaths due to subacute sclerosing panencephalitis (SSPE), a rare, universally fatal, complication of measles. 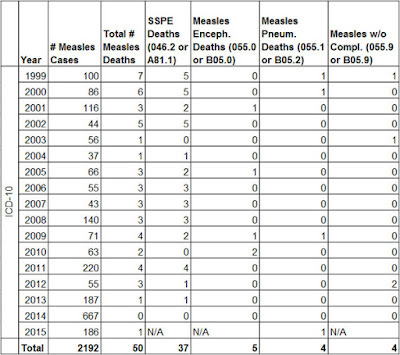 Before we get into all of those other deaths, let's take a look at just the lab-confirmed measles deaths. We have two in 2003 and one in 2015. From 2003-2015, there were 1,846 cases of measles in the U.S., giving us a mortality rate of about 1.6 deaths for every 1,000 cases. This doesn't differ much from the mortality rate around the time the vaccine was introduced. The picture changes, somewhat, when we include data from death certificates. The National Vital Statistics System provides a wealth of additional information on births and deaths in this country. 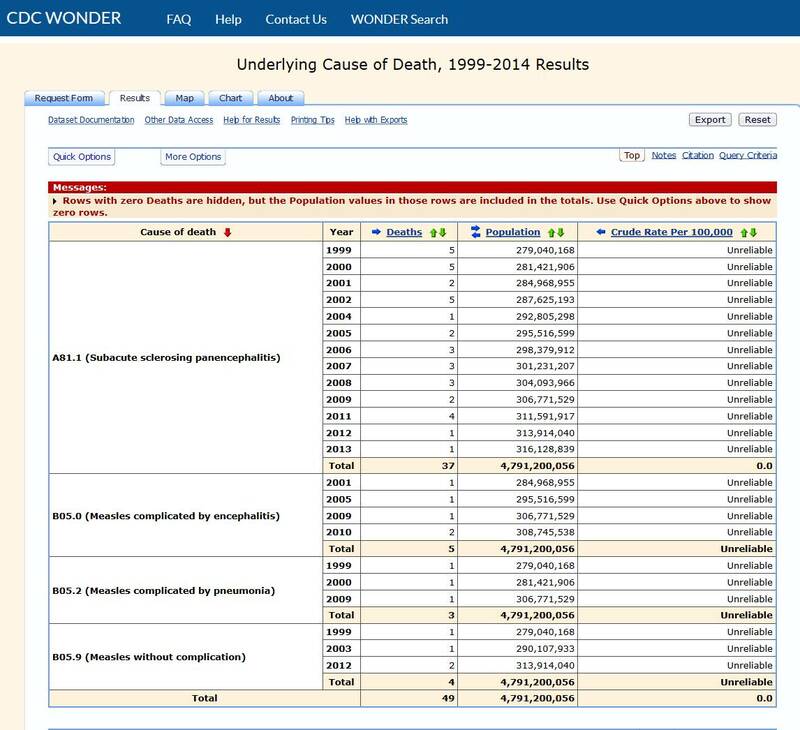 Accessed via the CDC's WONDER database, anyone can look up data on the underlying cause of death, with the caveat that the recorded cause of death reflects the physician's best clinical judgment. It can then be grouped by a variety of criteria, letting users slice and dice things to a great level of detail. 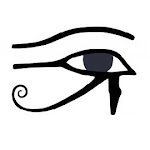 We could see how many people died of a particular disease or disease complication, what year they died, what the age distribution was, and so forth. Note: The 2003 total only includes data from NVSS. CDC confirms there were two deaths that year. This should begin to illustrate the toll that measles takes on people, even those living in affluent countries. And remember, this is only looking at deaths from measles. The virus can also cause a number of non-fatal, but still serious complications, such as encephalitis (resulting in deafness or intellectual disability), ear infections (resulting in hearing loss), and pneumonia. Around 1 in 10 kids need to be hospitalized due to measles, though, again, certain doctors who value stories over facts may try to claim that those are "soft hospitalizations". Furthermore, measles can make its victims susceptible to other diseases (even ones they've had before) for up to 2-3 years. The next time you see or hear someone saying that measles "isn't that bad", remind them that it still kills a fair number of those it infects, even in the United States. Show them these numbers. Remind them that it does more than kill. It also disables. It makes them more vulnerable to other diseases. Even those who are not permanently injured can still spend time in the hospital receiving supportive care. 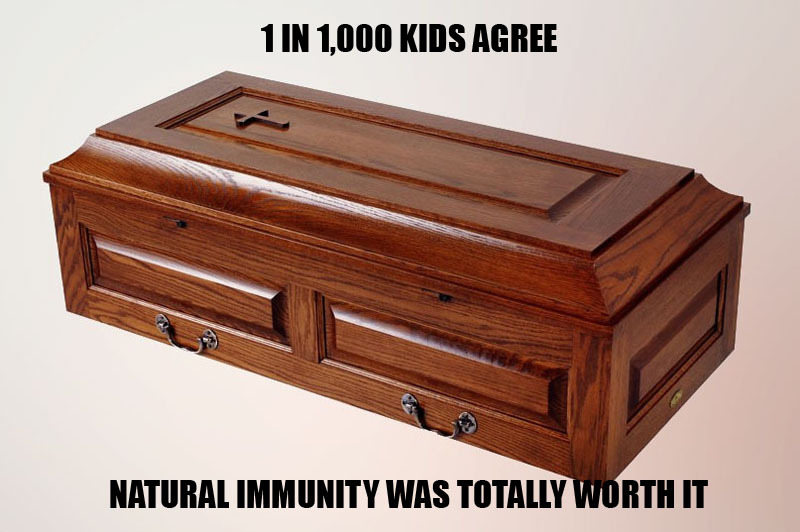 And if they advocate getting immunity "the natural way" (i.e., by suffering through an infection), possibly even recommending hosting a measles tea, do your best to steer them away from such orgies of death. They can achieve immunity without the disease, and without being medically negligent, thanks to vaccinations. Centers for Disease Control and Prevention WONDER Database. Compressed mortality, 1979-1998. National Vital Statistics System. Centers for Disease Control and Prevention WONDER Database. Detailed mortality, 1994-2014. National Vital Statistics System. Mina, MJ, Mercalf, CJE, de Swart, RL, Osterhaus, ADME, & Grenfell, BT. (2015). Long-term measles-induced immunomodulation increases overall childhood infectious disease mortality. Science, 348(6235), 694-699. Shapiro, H & Weir, E. (2001). Measles in your office. Canadian Medical Association Journal, 164(11), 1614. Not too dissimilar from the Swansea epidemic in the UK in 2012, where 1219 were infected, 88 hospitalized and one died. This is not an advertisement for a movie, just a suggestion! Next month many parents will be taking their children to see a film based on Roald Dahl's book The BFG. Before seeing the movie parents should read the book to their child (or children), and then explain why it is dedicated to a little girl named Olivia.